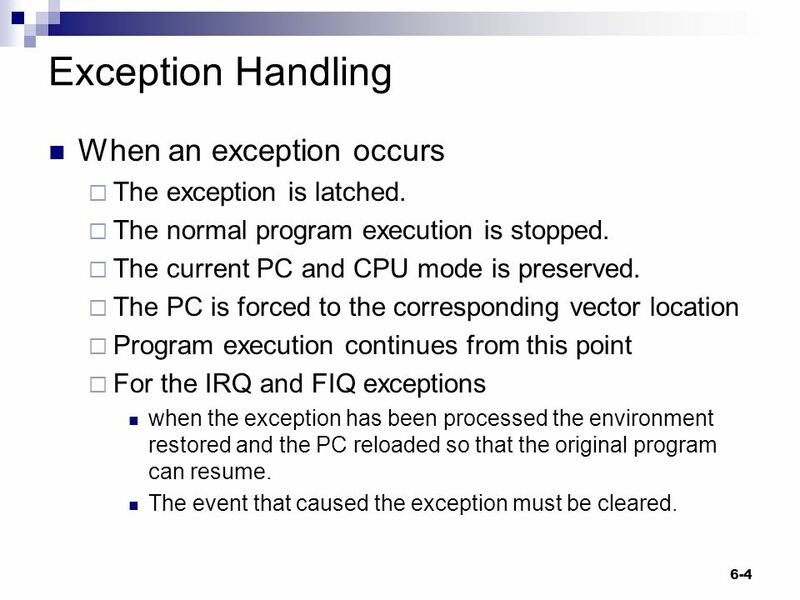 5 ARM 7 Exception handling When an exception occurs, the CPU will change modes and the PC will be forced to an exception vector. 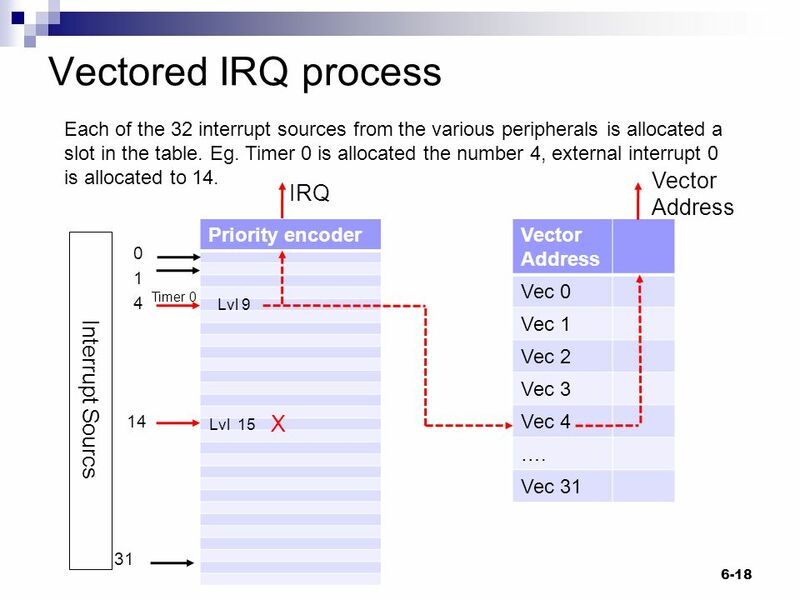 The vector table starts from address zero with the reset vector, and then has an exception vector every four bytes. 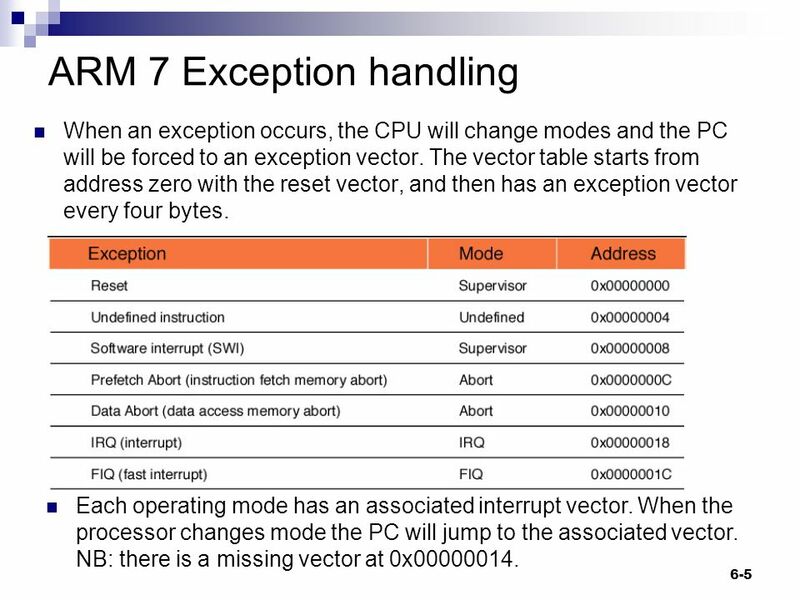 6-5 Each operating mode has an associated interrupt vector. 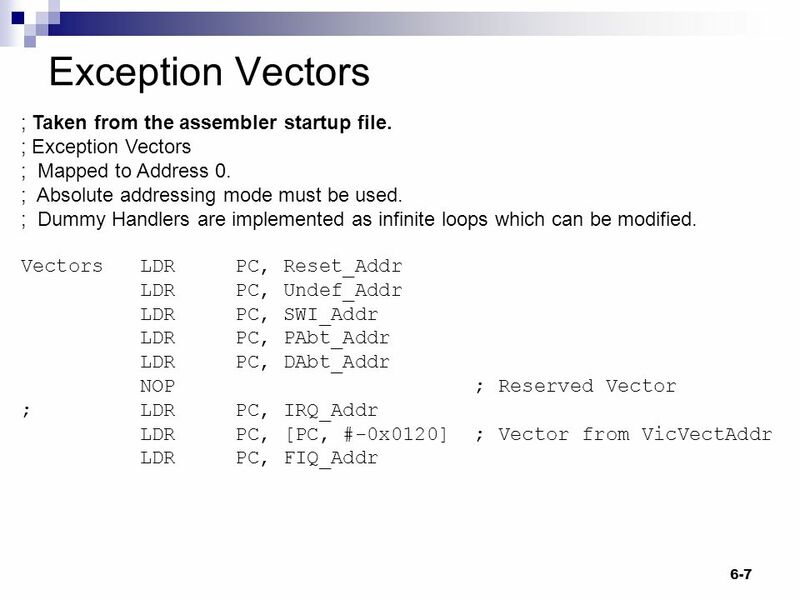 When the processor changes mode the PC will jump to the associated vector. 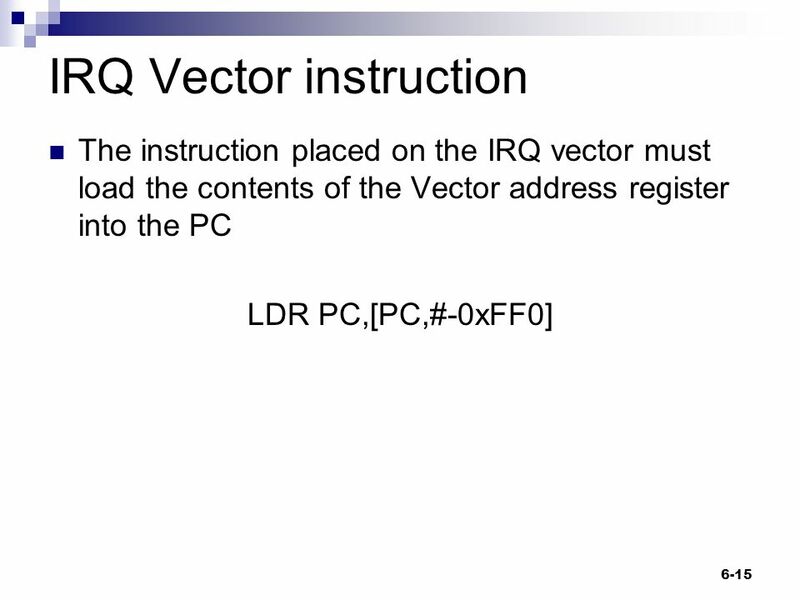 NB: there is a missing vector at 0x00000014. 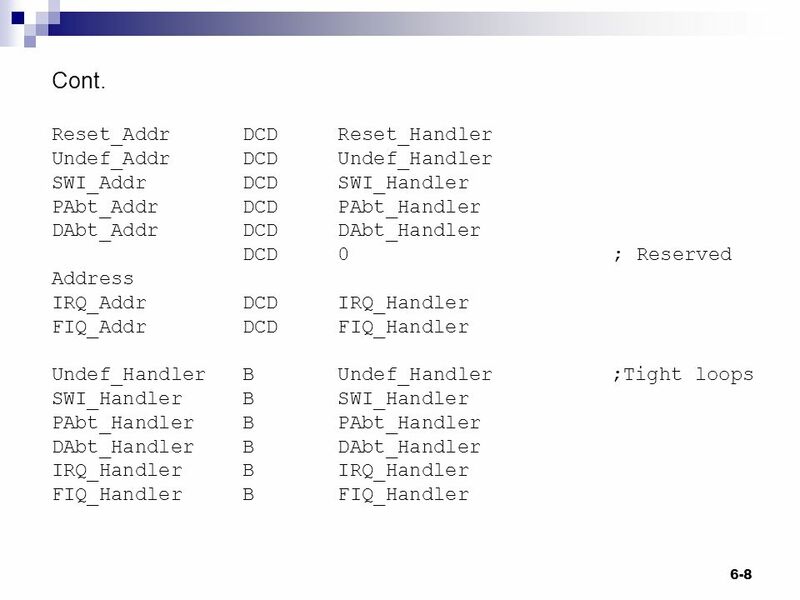 8 6-8 Reset_Addr DCD Reset_Handler Undef_Addr DCD Undef_Handler SWI_Addr DCD SWI_Handler PAbt_Addr DCD PAbt_Handler DAbt_Addr DCD DAbt_Handler DCD 0 ; Reserved Address IRQ_Addr DCD IRQ_Handler FIQ_Addr DCD FIQ_Handler Undef_Handler B Undef_Handler;Tight loops SWI_Handler B SWI_Handler PAbt_Handler B PAbt_Handler DAbt_Handler B DAbt_Handler IRQ_Handler B IRQ_Handler FIQ_Handler B FIQ_Handler Cont. 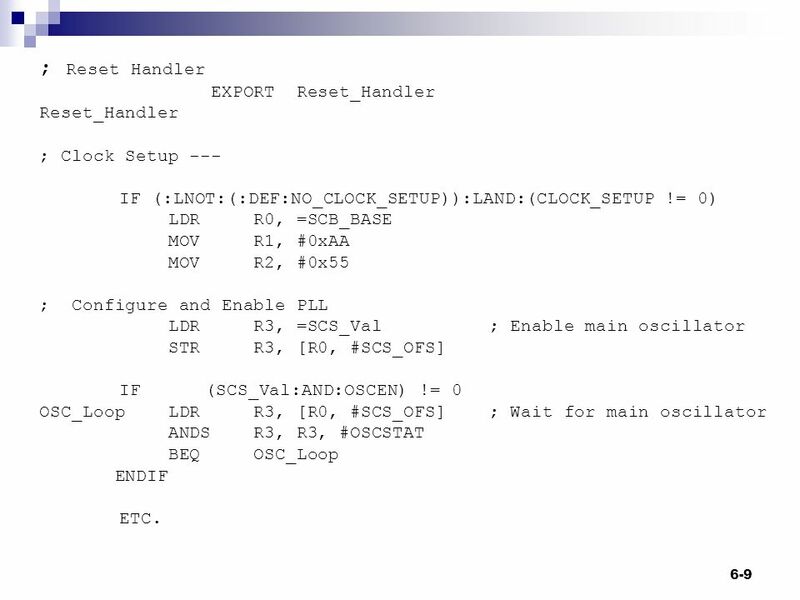 9 6-9 ; Reset Handler EXPORT Reset_Handler Reset_Handler ; Clock Setup --- IF (:LNOT:(:DEF:NO_CLOCK_SETUP)):LAND:(CLOCK_SETUP != 0) LDR R0, =SCB_BASE MOV R1, #0xAA MOV R2, #0x55 ; Configure and Enable PLL LDR R3, =SCS_Val ; Enable main oscillator STR R3, [R0, #SCS_OFS] IF (SCS_Val:AND:OSCEN) != 0 OSC_Loop LDR R3, [R0, #SCS_OFS] ; Wait for main oscillator ANDS R3, R3, #OSCSTAT BEQ OSC_Loop ENDIF ETC. 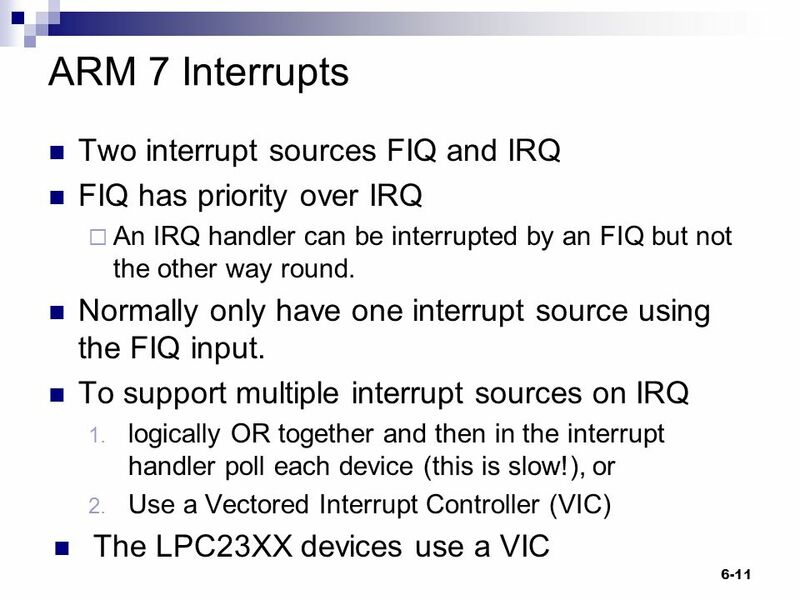 10 Interrupts 6-10 Two interrupt request inputs to the CPU FIQ - fast interrupt request FIQ higher priority than IRQ Two interrupt request inputs. 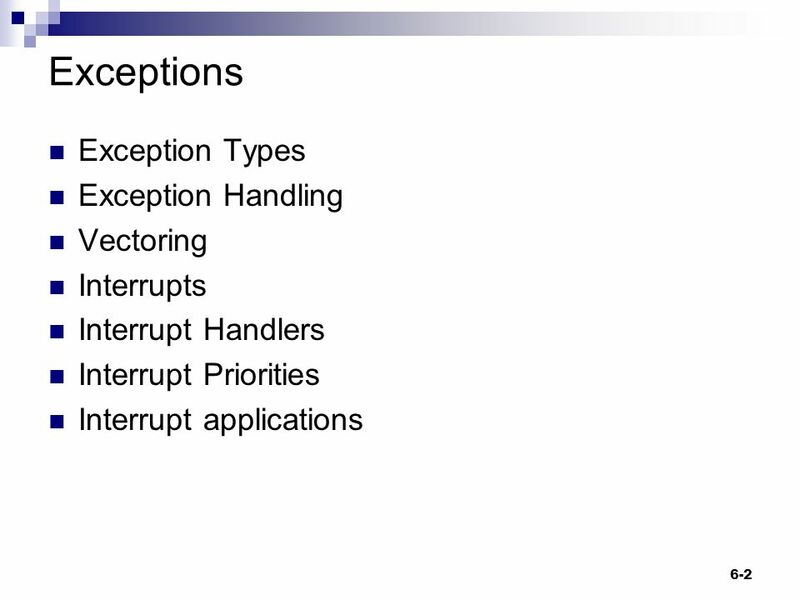 n implies not i.e. active low. 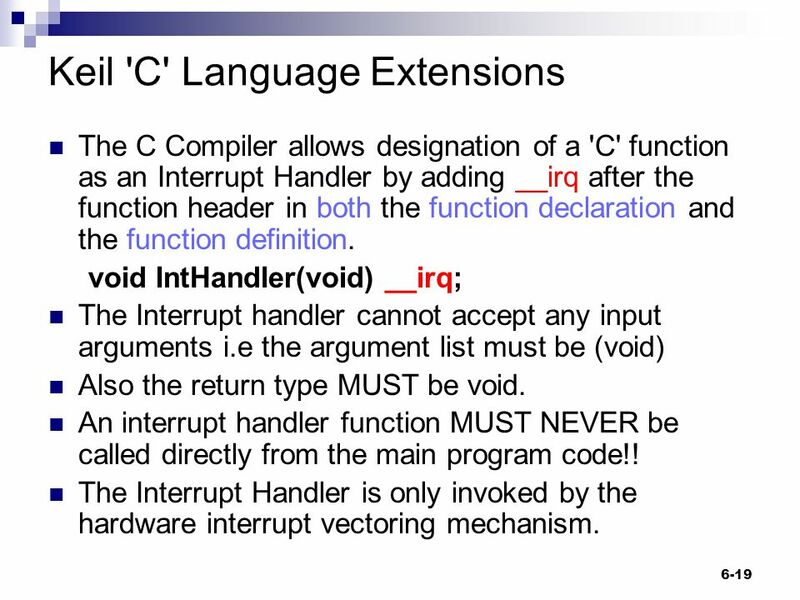 19 6-19 Keil 'C' Language Extensions The C Compiler allows designation of a 'C' function as an Interrupt Handler by adding __irq after the function header in both the function declaration and the function definition. 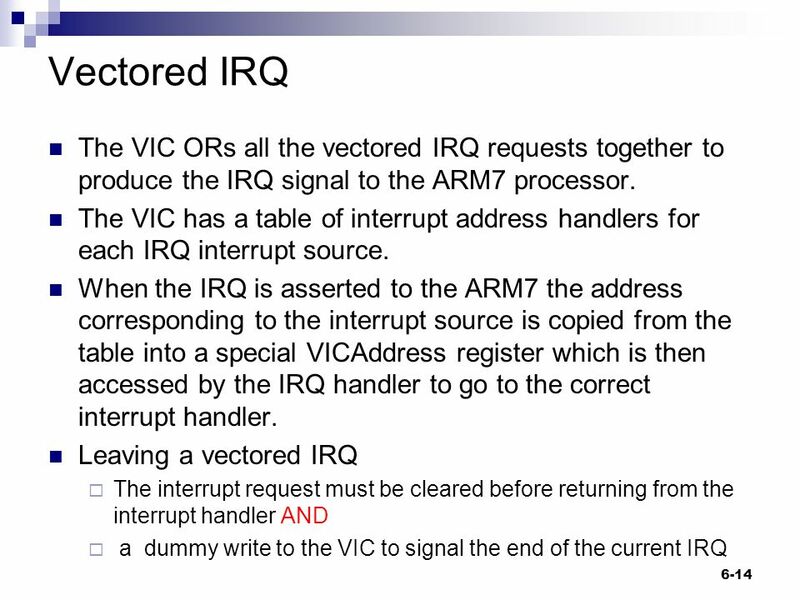 void IntHandler(void) __irq; The Interrupt handler cannot accept any input arguments i.e the argument list must be (void) Also the return type MUST be void. 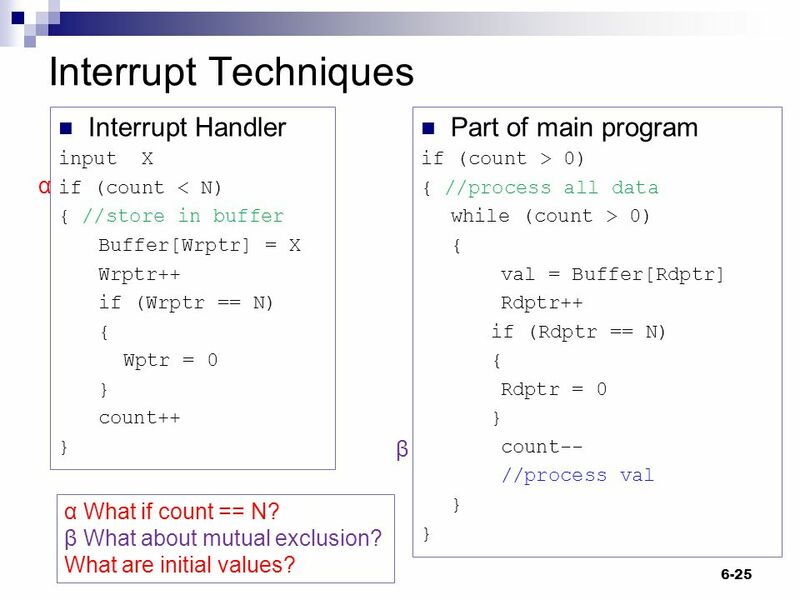 An interrupt handler function MUST NEVER be called directly from the main program code!! 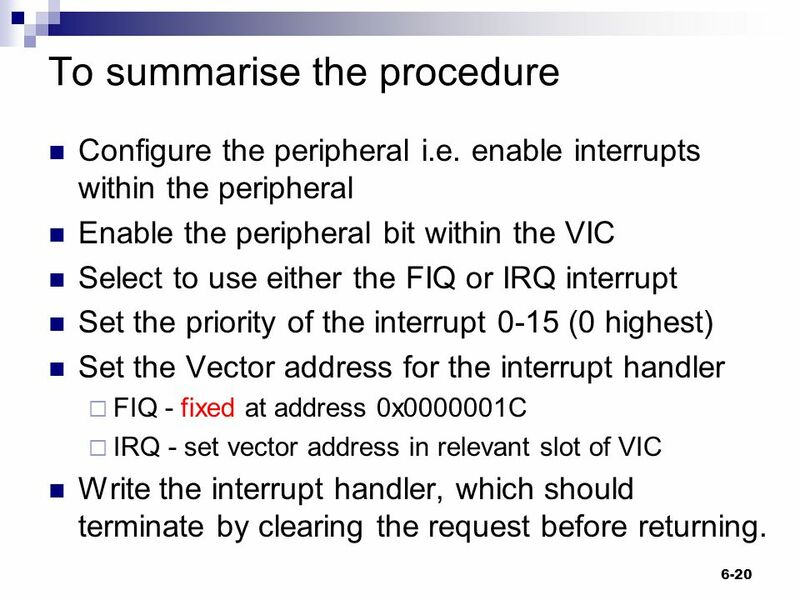 The Interrupt Handler is only invoked by the hardware interrupt vectoring mechanism. 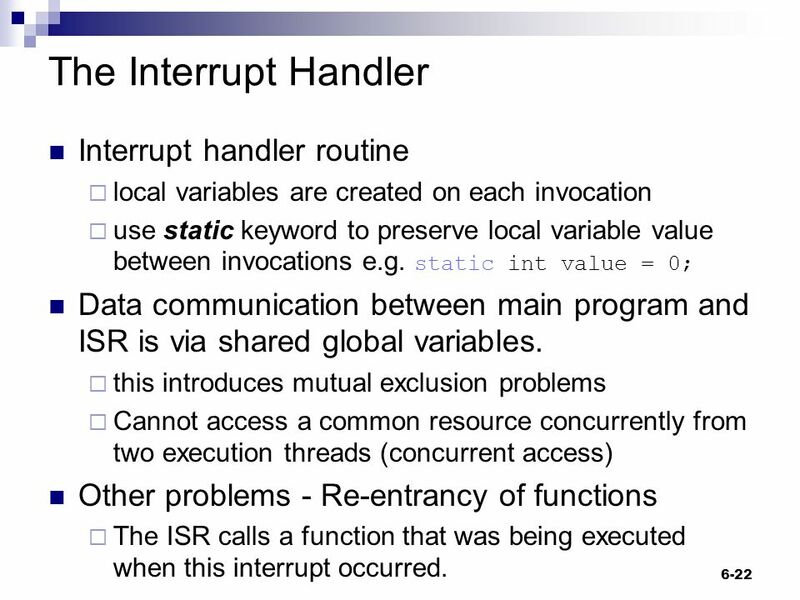 22 6-22 The Interrupt Handler Interrupt handler routine  local variables are created on each invocation  use static keyword to preserve local variable value between invocations e.g. 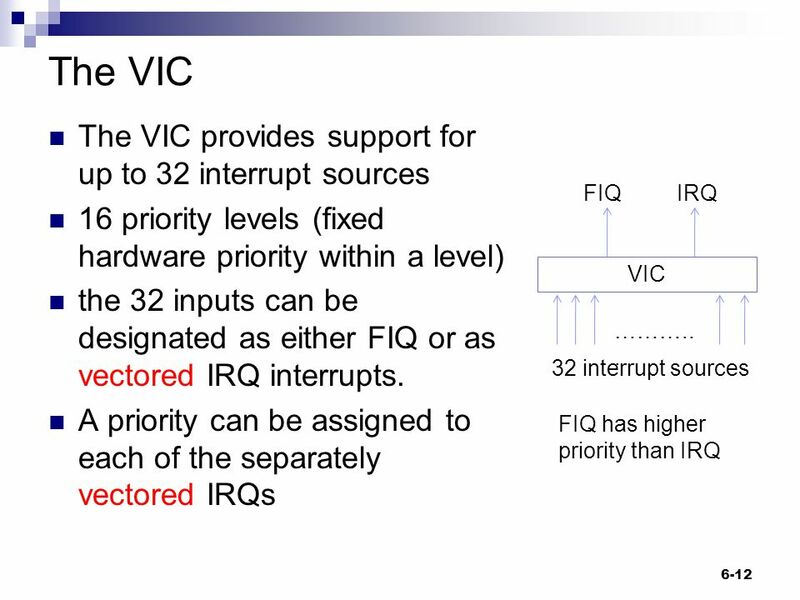 static int value = 0; Data communication between main program and ISR is via shared global variables. 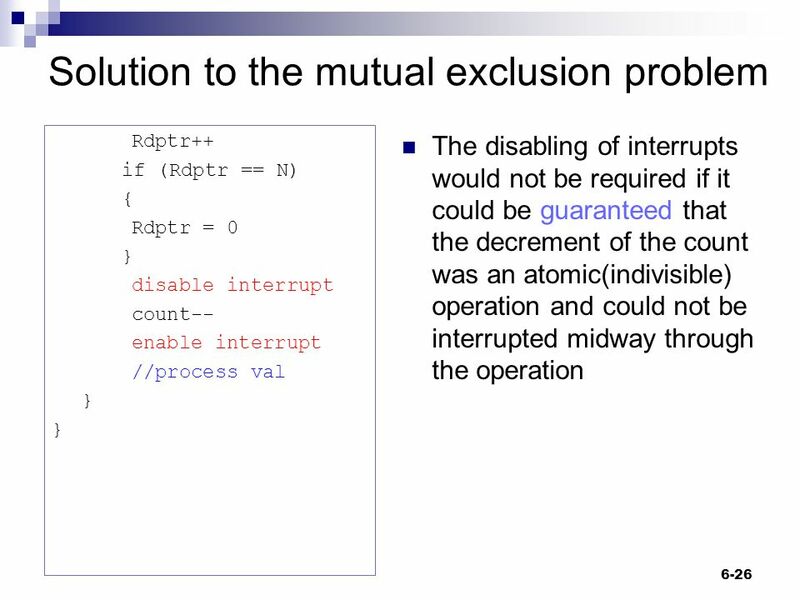  this introduces mutual exclusion problems  Cannot access a common resource concurrently from two execution threads (concurrent access) Other problems - Re-entrancy of functions  The ISR calls a function that was being executed when this interrupt occurred. 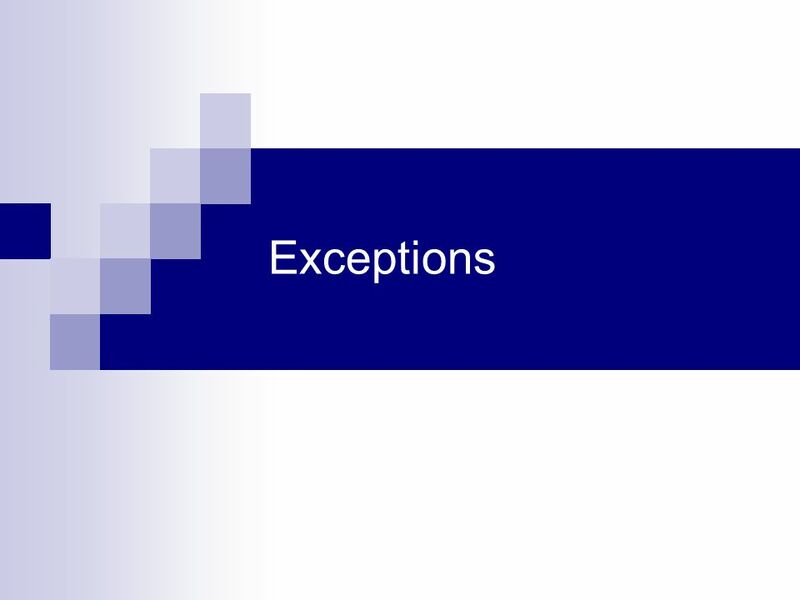 Download ppt "Exceptions. 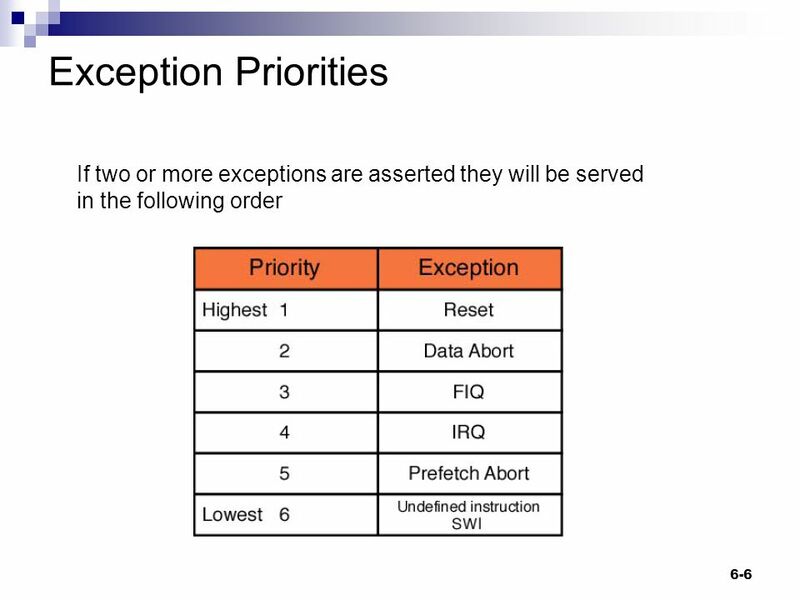 Exception Types Exception Handling Vectoring Interrupts Interrupt Handlers Interrupt Priorities Interrupt applications 6-2." Copyright © 2000, Daniel W. Lewis. All Rights Reserved. CHAPTER 10 SHARED MEMORY. 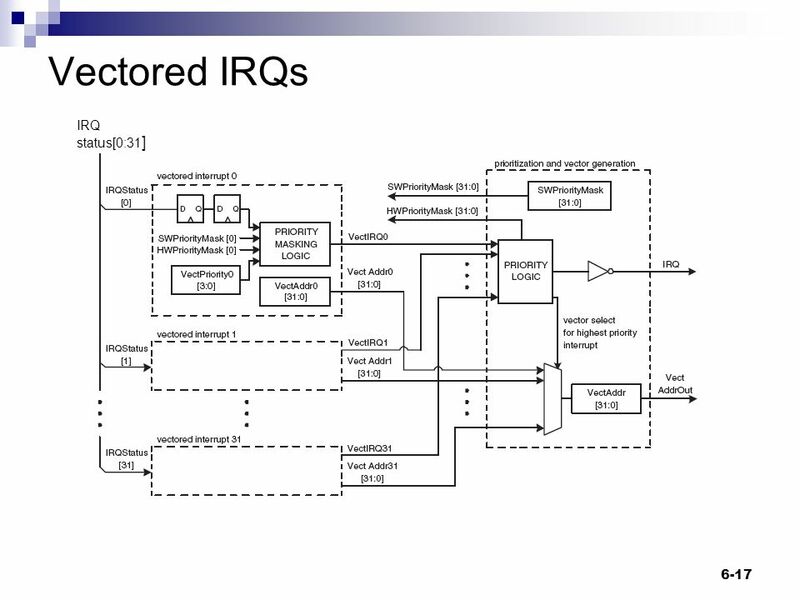 Lab III Real-Time Embedded Operating System for a SoC System. 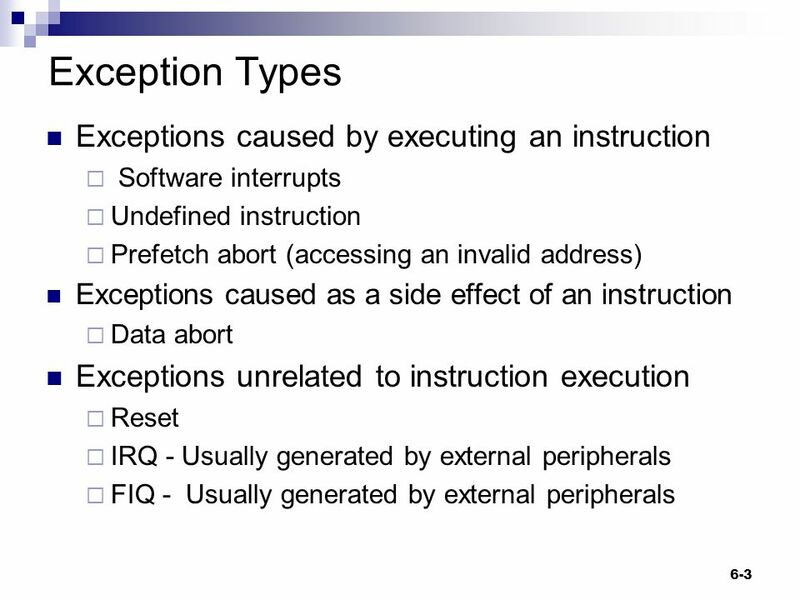 1 Exceptions, Interrupts & Traps Operating System Hebrew University Spring 2007. 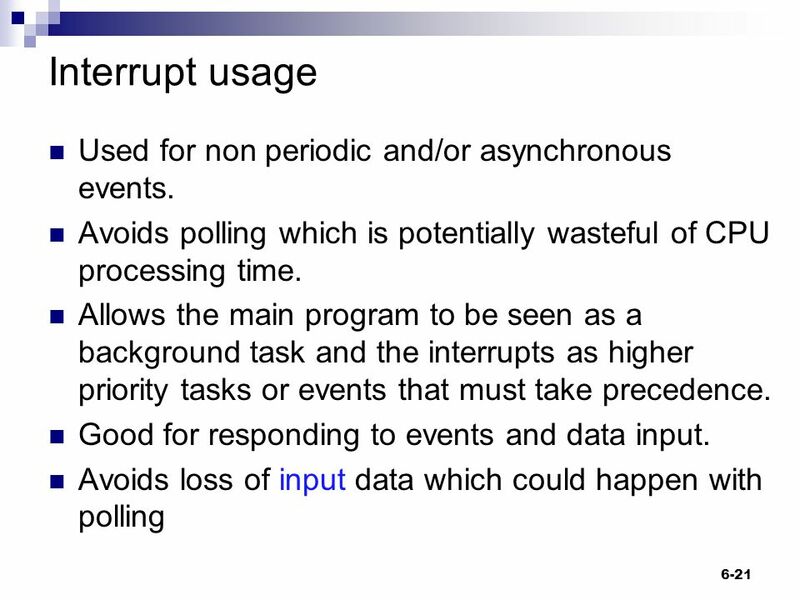 Process Synchronization. 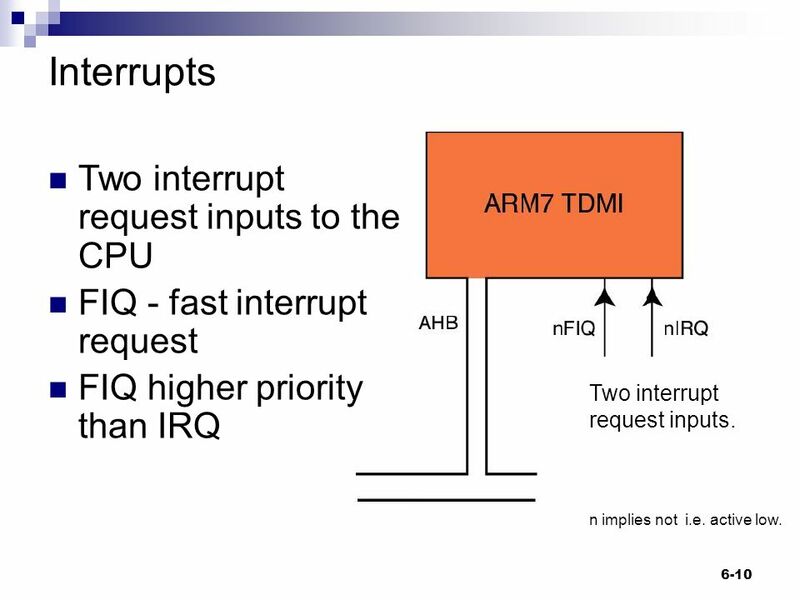 Module 6: Process Synchronization Background The Critical-Section Problem Peterson’s Solution Synchronization Hardware Semaphores. Computertechniek Hogeschool van Utrecht / Institute for Computer, Communication and Media Technology 1. 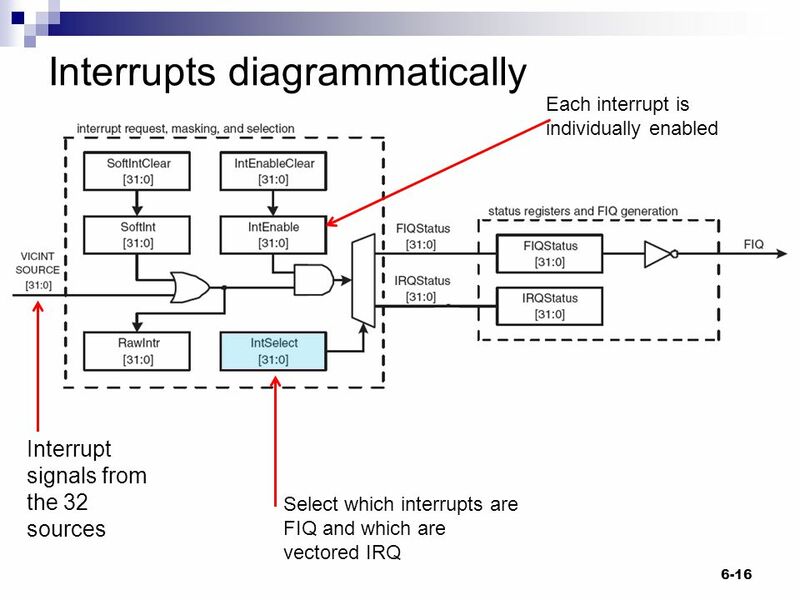 A look at interrupts What are interrupts and why are they needed. 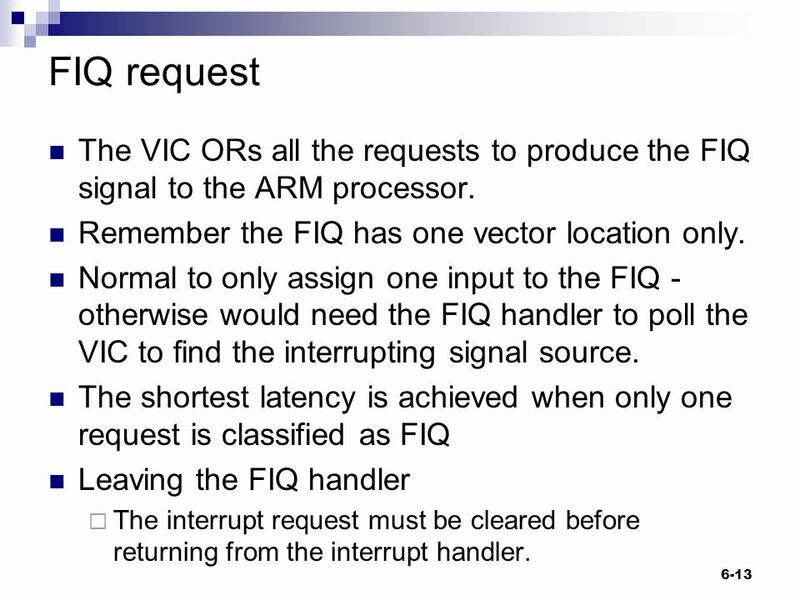 Mark Neil - Microprocessor Course 1 Timers and Interrupts. 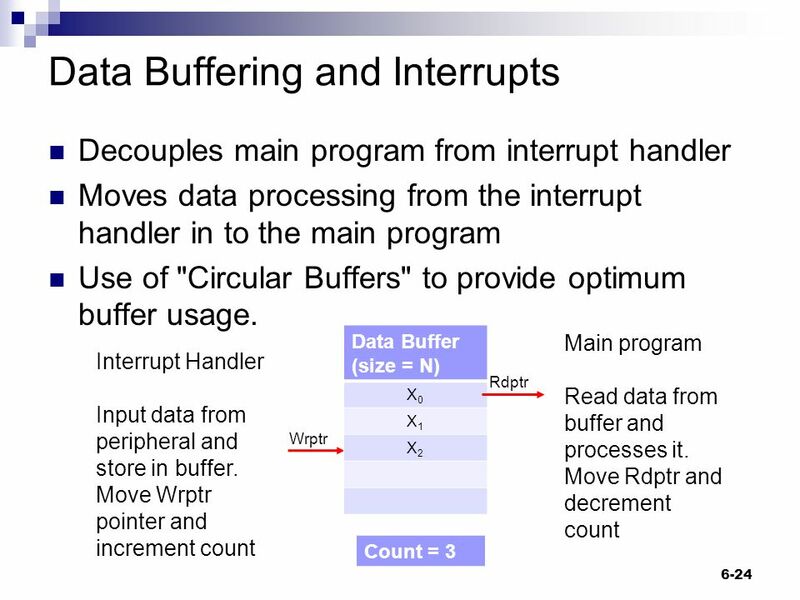 COMP3221: Microprocessors and Embedded Systems Lecture 15: Interrupts I Lecturer: Hui Wu Session 1, 2005. 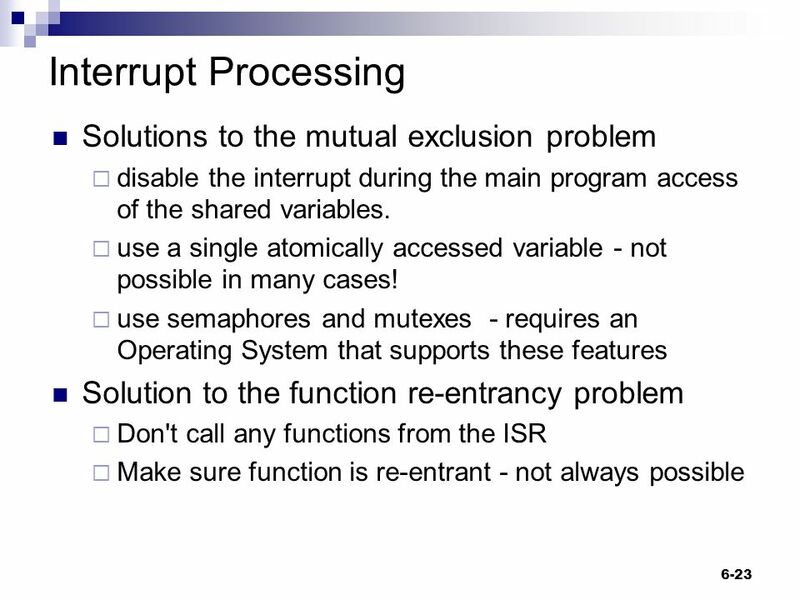 Communication Lab - Interrupts 1/13 Sequential Programming  Our C++ programs are sequential ( סדרתיים), they start at the first instruction and end at.